Super Strong Magnets - Wind & Solar Products - Wholesale To The Public! All our magnets are extremely powerful high grade Neodymium, grade N42 or higher. They are a lot stronger than normal Neodymium magnets (N35, N38, N42, N45 or even N48, N50) on the market today. Pull Force is the amount of force required to separate 2 of the same size magnets from each other. Pull force can vary significantly as a result of surface conditions, direction of pull, type of steel, etc. Pull force values on our site are presented to aid in design, but, the user should not use them as a definative reference. Make sure you read the magnet safety warnings on our site before you purchase or use them. 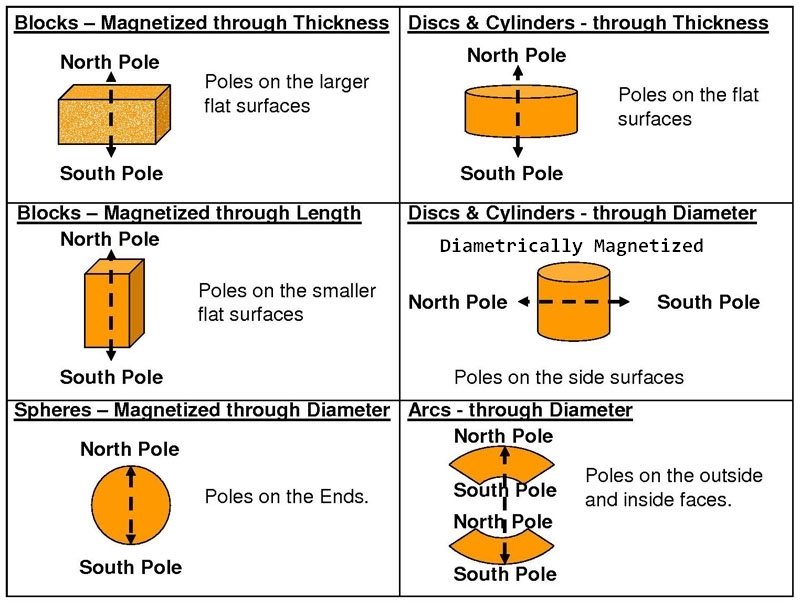 If you are interested in finding out answers to questions such as "How does a magnet work?" or "How is a magnet made? ", please read the "frequently asked questions" about magnets below. 1. How are NdFeB (Neodymium Iron Boron) Rare Earth Magnets Made ? 2. How do NdFeB (Neodymium Iron Boron) Rare Earth Magnets work ? Neodymium NdFeB rare earth magnets are sintered by powder metallurgy with chemical composition of Nd, Fe, B and other minor elements. Neodymium Iron Boron (NdFeB) magnets are composed of Nd, Fe, B, Dy, Co and other minor elements. NdFeB neodymium magnets are the rare earth magnets with the highest magnetic performance and coercive force in the world. Neodymium NdFeB magnet have excellent magnetic properties and are extremely strong for their small size. NdFeB magnets are more sensitive to temperature changes, ranging from 0.10%/°C - 0.13%/°C. NdFeB magnets are permanent magnets with the highest maximum energy product. Over the last 10 years, due to the high ratio of performance over price of the NdFeB magnets, NdFeB magnets have become extremely popular in almost all high technology applications that require high performance magnets, motors, sensors, computers, communications, medical equipment, meters, home appliances and so on. 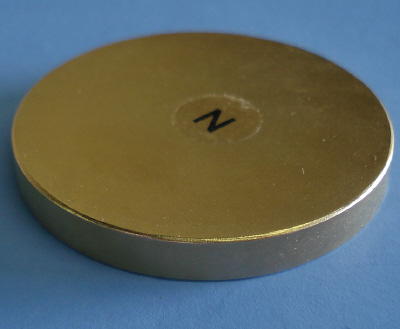 Neodymium NdFeB magnets are mechanically stronger than Sm-Co magnets and less brittle than ceramic & AlNiCo magnets. However, sintered NdFeB magnets are very easy to be corroged. Therefore, Neodymium NdFeB magnets have to be protected with a special coating, such as Zn, Ni, Ni-Cu-Ni, or epoxy. 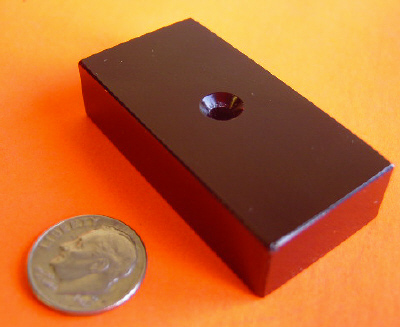 In general, sintered NdFeB magnets need some finish machining to meet the final tolerance. Compositions of neodymium, iron , iron-boron, dysprosium and minor additions including cobalt , copper , gallium, aluminum and others are mixed and induce-melted to form Nd2Fe14B phase and other necessary structures required for high performance permanent magnets. The melting temperature reaches over 1300o C. Usually repeated melting is needed to produce an even phase and structure distribution . The ingots from the vacuum melting process are crushed into coarse powder directly , or strip cast followed by HDDR processing into coarse powder . The coarse powder further milled into required particles sized about 3 microns in diameter by a jet miller . Those particles become single-domain and anisotropic whichare critical for producing a high coercivity magnet. Jet milling is the most effective way to mill the particles so far. Compact the fine powder to produce block magnets. Usually a magnetic field is applied during pressing to align those anisotropic particles in order to produce maximum magnetic output in a particular direction. There are two pressing methods, transverse and axial , depending on different applications. Isostatic pressing is normally used to further densify magnets to 75-80% . The compacted magnets are sintered at temperatures above 1000 o C and for many hours to be solidified and compacted further more up to 99% by shrinking it's body. A required microstructure between particles for high performance permanent magnets is also formed in this stage. Some following heat-treatments are needed to stabilize the magnets . Shrinkage and distortion during sintering is too difficult to control adequately and magnets normally need at least a “ clean up” grind on the surface. Small parts are cut or sliced precisely to form a big block to meet the demanding tolerances and different shapes . Various surface treatments can be applied on the final products . They include zinc, nickel ,Ni-Cu-Ni multi-layer, e-coating , epoxy and others. They provide different surface finishing, appearance and corrosion resistance, applicable to different application environments. This is the final step. Magnets are inspected based on customer specifications and needs, including dimensional and magnetic tests.